This chapter analyses the impact of the 2008 global economic crisis on Hungary and other Central and Eastern Europe (CEE) economies. It shows how the global economic crisis hit the region hard, contributing to widespread public anger and disillusionment over the central tenets of neoliberal transformation in the region: free market capitalism, liberal democratic institutions, and European Union (EU) membership. As the negative impact of the global economic crisis deepened, it opened up a space for critics of neoliberalisation throughout the region to push for change: in Hungary this ‘window of opportunity’ was seized by the neo-conservative Fidesz and the far-right Jobbik party, who pushed for stronger intervention in the economy along national-populist lines. 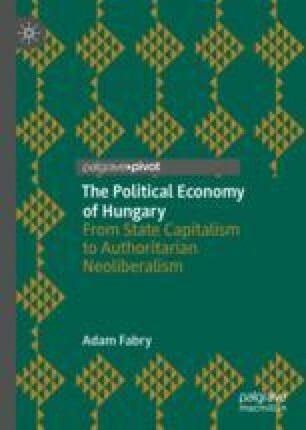 The chapter finds that the Socialists and the Free Democrats, who had been the principal advocates of Hungary’s particular ‘variety of neoliberalism’ in the 1990s and 2000s, eventually succumbed to the challenges of the political Right, resulting in their historical defeat in the 2010 general elections. Bajnai, G. (2010, April 7). Zonder vertrouwen van de markten stik je. NRC Handelsblad. Retrieved from https://www.nrc.nl/nieuws/2010/04/07/zonder-vertrouwen-van-de-markten-stik-je-11873649-a477122. Budapest Business Journal. (2017, November 7). Hungarian Names Appear in Paradise Papers. Budapest Business Journal. Retrieved from https://budapestbeacon.com/ungarys-ambassador-to-bern-istvan-nagy-viktor-orbans-swiss-banker. ‘Dijsselbloem Admits: “We Used Taxpayers’ Money to Save the Banks”’. (2017, November 10). Keep Talking Greece Blog. Retrieved April 24, 2018, from http://www.keeptalkinggreece.com/2017/11/10/dijsselbloem-taxpayers-save-banks. F, K. (2010, June 11). Az amerikai jegybankelnökkel jobban járnánk. Heti Válasz. Retrieved September 12, 2014, from http://valasz.hu/itthon/az-amerikai-jegybankelnokkel-jobban-jarnank-30019. Fabry, A. (2015a, August 10). The Far-Right as a Counter-Hegemonic Bloc to Neoliberalism? The Case of Jobbik—Part 1. LeftEast. Retrieved July 21, 2016, from http://www.criticatac.ro/lefteast/the-far-right-as-a-counter-hegemonic-bloc-to-neoliberalism-the-case-of-jobbik. Fabry, A. (2015b, September 25). The Far-Right as a Counter-Hegemonic Bloc to Neoliberalism? The Case of Jobbik—Part 2. LeftEast. Retrieved July 21, 2016, from http://www.criticatac.ro/lefteast/the-far-right-as-a-counter-hegemonic-bloc-to-neoliberalism-the-case-of-jobbik-2. Hudson, M. (2010). Neoliberalism and the Counter-Enlightenment. Retrieved August 9, 2016, from http://michael-hudson.com/2010/05/neoliberalism-and-the-counter-enlightenment. International Consortium of Investigative Journalists. (2018). Offshore Leaks Database. International Consortium of Investigative Journalists (ICIJ). Retrieved from https://offshoreleaks.icij.org. Klein, N. (2008, October 6). Wall St. Crisis Should Be for Neoliberalism What Fall of Berlin Wall Was for Communism. Democracy Now!. Retrieved April 4, 2017, from https://www.democracynow.org/2008/10/6/naomi_klein. Medián. (2009, March 18). Van még lejjebb?. Medián. Retrieved April 11, 2018, from http://www.webaudit.hu/object.5748fc63-7ae2-433f-82ca-4e24721f3579.ivy. MTI. (2007, December 20). Gyurcsány: Ilyen brutális nyomás még nem nehezedett kormányra. Heti Világgazdaság. Retrieved April 18, 2018, from http://hvg.hu/itthon/20071220_gyurcsany_evertekelo_nyugdij. Orbán, V. (2010). A nyugati típusú kapitalizmus került válságba. Speech at 21st Summer University and Youth Camp, Tusnádfürdő (Băile Tuşnad), Romania, July 24, 2010. Retrieved October 9, 2013, from http://www.miniszterelnok.hu/beszed/a_nyugati_tipusu_kapitalizmus_kerult_valsagba. Origo.hu. (2010, October 10). Díjat kapott Washingtonban Simor András. Origo.hu. Retrieved January 18, 2014, from http://www.origo.hu/uzletinegyed/hirek/20101010-euromoney-a-felzarkozo-europai-regioban-az-ev-jegybankara-lett-simor.html. Stiglitz, J. E. (2008, July 7). The End of Neo-liberalism? Project Syndicate. Retrieved April 16, 2018, from http://www.project-syndicate.org/commentary/the-end-of-neo-liberalism. UNCTAD. (2016). Foreign Direct Investment: Inward and Outward Flows and Stock, Annual, 1970–2016. UNCTAD Statistical Database. Retrieved May 28, 2018, from http://unctadstat.unctad.org/wds/TableViewer/tableView.aspx. World Bank Database. (2018). Retrieved from https://data.worldbank.org.